Romania (/roʊˈmeɪniə/ ( listen) ro-MAY-nee-ə; Romanian: România [romɨˈni.a] ( listen)) is a country located at the crossroads of Central, Eastern, and Southeastern Europe. It borders the Black Sea to the southeast, Bulgaria to the south, Ukraine to the north, Hungary to the west, Serbia to the southwest, and Moldova to the east. It has a predominantly temperate-continental climate. With a total area of 238,397 square kilometres (92,046 sq mi), Romania is the 12th largest country and also the 7th most populous member state of the European Union, having almost 20 million inhabitants. Its capital and largest city is Bucharest, and other major urban areas include Cluj-Napoca, Timișoara, Iași, Constanța, Craiova, and Brașov. The River Danube, Europe's second-longest river, rises in Germany's Black Forest and flows in a general southeast direction for 2,857 km (1,775 mi), coursing through ten countries before emptying into Romania's Danube Delta. The Carpathian Mountains, which cross Romania from the north to the southwest, include Moldoveanu Peak, at an altitude of 2,544 m (8,346 ft). The Republic of Moldova is the most common country of origin of foreign-born residents in Romania. Romania has recently experienced a growing wave of immigration, mostly from the Republic of Moldova, Turkey, Italy, Spain, China, and Vietnam, but also from North Africa, the Middle East, and the former Soviet Union, and to a lesser extent other parts of the world. In 2013, there were 198,839 immigrants living in Romania, of which 13,000 were refugees. Immigration is expected to increase in the future, as large numbers of Romanian workers leave the country and are being replaced by foreigners. The Kingdom of Romania was neutral for the first two years of World War I, entering on the side of the Allied powers from 27 August 1916 until Central Power occupation led to the Treaty of Bucharest in May 1918, before reentering the war on 10 November 1918. It had the most significant oil fields in Europe, and Germany eagerly bought its petroleum, as well as food exports. King Carol favored Germany but after his death in 1914, King Ferdinand and the nation's political elite favored the Entente. For Romania, the highest priority was taking Transylvania from Hungary, with its 3,000,000 Romanians. The Allies wanted Romania to join its side in order to cut the rail communications between Germany and Turkey, and to cut off Germany's oil supplies. Britain made loans, France sent a military training mission, and Russia promised modern munitions. The Allies promised at least 200,000 soldiers to defend Romania against Bulgaria to the south, and help it invade Austria. In the Romantic era, the concept of a national state emerged among the Romanians, as among many other peoples of Europe and a "national awakening" began. Defining their nation against the nearby Slavs, Germans, and Hungarians, the nationalist Romanians looked for models of nationality in the other Latin countries, notably France. About 10.5% of Romania's population is represented by minorities (the rest of 89.5% being Romanians). The principal minorities in Romania are Hungarians (Szeklers, Csangos, and Magyars; especially in Harghita, Covasna, and Mureș counties) and Romani people, with a declining German population (in Timiș, Sibiu, Brașov) and smaller numbers of Poles in Bukovina (Austria-Hungary attracted Polish miners, who settled there from the Kraków region in contemporary Poland during the 19th century), Serbs, Croats, Slovaks and Banat Bulgarians (in Banat), Ukrainians (in Maramureș and Bukovina), Greeks (Brăila, Constanța), Jews (Wallachia, Bucharest), Turks and Tatars (in Constanța), Armenians, Russians (Lippovans, in Tulcea), Afro-Romanians and others. The Romanian Academy (Romanian: Academia Română) is a cultural forum founded in Bucharest, Romania, in 1866. It covers the scientific, artistic and literary domains. The academy has 181 acting members who are elected for life. Romania's administration is relatively centralized and administrative subdivisions are therefore fairly simplified. According to National Tourism Statistics 15.7 million domestic and foreign tourists stayed in overnight accommodations in 2018. Of these 2.2 million are recorded as foreign tourists. Osk, Rapid and CFR Cluj, each of whom had mixed European success. Romania is one of only four national teams from Europe that took part in the first World Cup in 1930. The Romania national football team has taken part in seven FIFA World Cups and had its most successful run during the 1990s, when they reached the quarterfinals of the 1994 FIFA World Cup, losing a semifinal place against Sweden on the penalty kicks, Romania was ranked third by FIFA in 1997. Romania is one of the world's largest wine producers and fifth largest among European wine-producing countries, after Italy, France, Spain, and Germany. In 2018 it produced around 5.2 million hectolitres of wine. In recent years, Romania has attracted many European business people and wine buyers, due to the affordable prices of both vineyards and wines compared to other wine-producing nations such as France, Germany, and Italy. On May 14, 1981 Romania became the 11th country in the world to have an astronaut in space. That astronaut, Dumitru Prunariu is today's president of Romanian Space Agency. This is a timeline of Romanian history, comprising important legal and territorial changes and political events in Romania and its predecessor states. To read about the background to these events, see History of Romania. The Early Middle Ages in Romania started with the withdrawal of the Roman troops and administration from Dacia province in the 270s. In the next millennium a series of peoples, most of whom only controlled two or three of the nearly ten historical regions that now form Romania, arrived. During this period, society and culture underwent fundamental changes. Town life came to an end in Dacia with the Roman withdrawal, and in Scythia Minor – the other Roman province in the territory of present-day Romania – 400 years later. Fine vessels made on fast potter's wheels disappeared and hand-made pottery became dominant from the 450s. Burial rites changed more than once from cremation to inhumation and vice versa until inhumation became dominant by the end of the 10th century. Romania was the largest European producer of oil in World War II. The oil extracted from Romania was essential for Axis military operations. The petrochemical industry near Ploieşti was bombed heavily by American bombers (see Operation Tidal Wave). After the war, a heavy reconstruction and expansion was done under the communist regime. Since then, most of the industry has been privatized. ... that Romanian literary scholar Bonifaciu Florescu had the reputation of an unrepentant bohemian and allegedly slept on a pile of hay? ... that Romanian poet Petre Stoica, assigned to study German by a dean meeting a quota, later became an accomplished translator of German-language authors? ... that after taking up arms against Hungary during the failed 1848 revolution, Ioan Pușcariu, an ethnic Romanian, returned to work in Hungarian government service for decades? ... that Paludititan is a Romanian island dwarf? ... that in marking the centenary of the Horea, Cloșca and Crișan revolt, Transylvanian lawyer Rubin Patiția clashed with both the Hungarian authorities and his own Romanian Orthodox Church? ... that the literary historian Zoe Dumitrescu-Bușulenga, once a member of the Romanian Communist Party's central committee, became a nun late in life? Do you have a question about Romania that you can't find the answer to? For editor resources and to collaborate with other editors on improving Wikipedia's Romania-related articles, see WikiProject Romania. Timișoara (German: Temeschburg, Hungarian: Temesvár) was designated the European Capital of Culture in 2021. The Colțea Hospital in Bucharest completed a $90 million renovation in 2011. Gutthiuda, or the land of the Gothic-speaking Thervingi, and the neighboring tribes (370s AD). "Goddess" (an anthropomorphic clay figurine of the Cucuteni–Trypillia culture). Eastern Orthodoxy is the most widespread religious denomination in the country. The Romanian Revolution of 1989 was one of the few violent revolutions in the Iron Curtain that brought an end to Communist rule. Ethnic map of Romania based on 2011 census data. The Bucharest Stock Exchange Palace, situated in the capital's historical city centre. Ethnic map of the Kingdom of Romania based on the 1930 census data. Alexandru Ioan Cuza was the first Domnitor (i.e. Prince) of Romania (at that time the United Principalities of Wallachia and Moldavia) between 1862 and 1866. Romania's territorial losses in the summer of 1940. Of these territories, only Northern Transylvania was regained after the end of World War II. King Carol I of Romania with his nephew Ferdinand I of Romania and great-nephew Carol II of Romania. American B-24 Liberator flying over a burning oil refinery at Ploiești, as part of Operation Tidal Wave on 1 August 1943. Due to its role as a significant supplier of oil to the Axis, Romania was a prime target of Allied strategic bombing in 1943 and 1944. Sibiu (German: Hermannstadt, Hungarian: Nagyszeben) was the European Capital of Culture in 2007. Nicolae Ceaușescu ruled Romania as its Communist leader from 1965 until 1989. University of Bucharest was opened in 1864. Romania is the fourth largest contributor of troops in Afghanistan. Romania joined the European Union in 2007 and signed the Treaty of Lisbon. Romanian marine troopers during a combined Dutch-Romanian exercise at Vadu beach. Simona Halep has ended 2017 and 2018 as WTA's World No. 1. Romania has seen large waves of protests against judicial reforms during the 2017–2018 Romanian protests. Romania is a noteworthy ally of the United States, being the first NATO member state that agreed to support increasing its defence spending after the 2017 Trump-Iohannis meeting at the White House. Since 2007, Romania has been part of the EU single market. Romanian is an Eastern Romance language, part of the larger linguistic family of Romance languages alongside French, Italian, Spanish, Portuguese and Catalan. Skull from the "Cave with Bones" (the oldest known remain of Homo sapiens in Europe). 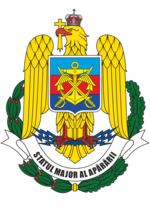 Romania joined NATO in 2004 and hosted its 2008 summit in Bucharest. A 4th-century pectoral cross from Dinogetia (a Roman town in Scythia Minor). King Michael I of Romania was forced to abdicate by the Communists in late December 1947, concomitant with the Soviet occupation of the country. The CEC Palace is situated on Bucharest's Victory Avenue. Changes in Romania's territory since 1859. Ceramics from Histria (a Greek colony on the Black Sea coast). Cristina Neagu is the only female handball player in history to win three IHF World Player of the Year awards.